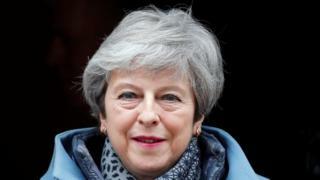 Britain Prime Minister Theresa May don promise Tory MPs say she go stand down if dem back her Brexit deal. Madam May no name any departure date for meeting with di 1922 committee. She tell di parliament say she dey: "prepared to leave di job earlier dan wen she intend to in order to do wetin dey right for our kontri and our party." Di PM say she know say Tory MPs no want her to lead di next phase of Brexit negotiations and she no go "stand in di way." Dis dey come after MPs seize control of di Commons agenda to hold votes on alternatives to di deal. Downing Street say e go be "different ball game" if Parliament no pass di deal. BREXIT: "UK go still dey tied to EU rules afta Brexit"